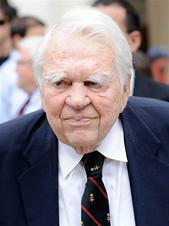 Last night '60 Minutes' turned the camera on Andy Rooney, long time essayist, presenter and now retired anchor. His interviewer Morley Safer mentioned that he gets a little hostile when fans approach him for autographs. He said "What kind of an idiot wants my name?" Safer replied "It's not a question of what kind of an idiot!" Rooney continued "I spent my first 50 years trying to become well known as a writer and the next 30 trying to avoid being famous. I walk down the street or go to a football game and people shout, 'Hey, Andy!' I hate that." The traced Rooney's life through the Great Depression, into World War II and throughout his career at CBS News. Safter commented that often Rooney was too political. He said it was too "hard to conceal the fact that I'm more of a Democrat than a Republican." Rooney also apologized for his comments on homosexuality and race which got him suspended, briefly, from the network. At the end of the interview the loveable grump Rooney asked why he would answer "an idiot who has the bad sense to write me a letter."